Happy holidays from Drum Corps International, and especially to you last minute shoppers! Place an order of $29 or more by 12 p.m. EST today (Monday, Dec. 22), and receive a free upgrade to Second-Day UPS shipping service for the cost of regular UPS Ground! 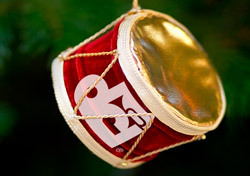 The Drum Corps International office will be closed Dec. 24 to 28. Orders placed during that period will be processed beginning on Monday, Dec. 29. Check out these last minute DVD deals. Shop all holiday deals at store.DCI.org.